There is a lot at play right now with last year’s tax law changes. No one knows how changes will affect giving this year. What we do know is that we need to talk to our donors about options for giving. More than likely, the terms and definitions offered below will be familiar to you and your donors. BUT, talking about them with your donors and understanding how these giving vehicles can benefit you and them is more important now than ever. 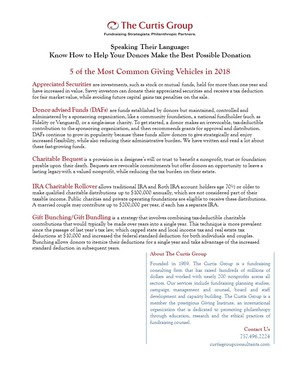 Below, you will find definitions for five of today’s common giving vehicles. There is also a printable overview that you can use to benefit your program. Appreciated Securities are investments, such as stock or mutual funds, held for more than one year and have increased in value. Savvy investors can donate their appreciated securities and receive a tax deduction for fair market value, while avoiding future capital gains tax penalties on the sale. Donor-advised Funds (DAFs) are funds established by donors but maintained, controlled and administered by a sponsoring organization, like a community foundation, a national fundholder (such as Fidelity or Vanguard), or a single-issue charity. To get started, a donor makes an irrevocable, tax-deductible contribution to the sponsoring organization, and then recommends grants for approval and distribution. DAFs continue to grow in popularity because these funds allow donors to give strategically and enjoy increased flexibility, while also reducing their administrative burden. We have written and read a lot about these fast-growing funds. To learn more, read this article. Charitable Bequest is a provision in a designee’s will or trust to benefit a nonprofit, trust or foundation payable upon their death. Bequests are revocable commitments but offer donors an opportunity to leave a lasting legacy with a valued nonprofit, while reducing the tax burden on their estate. IRA Charitable Rollover allows traditional IRA and Roth IRA accountholders age 70½ or older to make qualified charitable distributions up to $100,000 annually, which are not considered part of their taxable income. Public charities and private operating foundations are eligible to receive these distributions. A married couple may contribute up to $200,000 per year, if each has a separate IRA. Gift Bunching/Gift Bundling is a strategy that involves combining tax-deductible charitable contributions that would typically be made over years into a single year. This technique is more prevalent since the passage of last year’s tax law, which capped state and local income tax and real estate tax deductions at $10,000 and increased the federal standard deduction for both individuals and couples. Bunching allows donors to itemize their deductions for a single year and take advantage of the increased standard deduction in subsequent years. Curtis Group President Keith Curtis’ blog post about tax reform is a great starting point as is this Q&A article that Fideity Charitable published. Now… What Can You Do With This Information? 2. Disseminate: You might be surprised to learn that there are a number of your donors who may not know or have not considered the different avenues by which they could support your organization. Sharing this information will be a win/win. You can be a key player in the conversation as donors identify their philanthropic goals and how they can achieve them. 3. Plan:​ The Curtis Group is hosting a webinar next week about making your year-end fundraising plan. You should also incorporate the promotion of giving vehicles into your plans. Do you have a planned giving program? Do you effectively track your donors who have donor-advised funds, their personal contact information and how they want to be acknowledged? Are you aware of how the new tax code could impact your year-end giving? Register for the webinar here. 4. Update: Do you have this information available on your website and other communication platforms? Do you list the full legal name of your organization and your Tax ID, so your donors can provide it to their financial advisers? Are your name and contact information readily available so a potential supporter can easily call with questions? If you have questions about how to incorporate this information into your giving or how we can work together to strengthen and grow your fundraising program, we would welcome your call. Please call me at 757-496-2224 or email me at wendy@curtisgroupconsultants.com. Hilary Fulp, Client Manager at The Curtis Group, also contributed to this article.